Electric cars are becoming more and more common, and they provide their owners with a number of benefits, including efficient use of energy and savings on fuel. As electric cars continue to evolve to suit a market that wants to conserve energy, many people are considering purchasing one of these vehicles. However, before making the move away from a gas-powered car, it is important to understand the changes which will need to be made to your garage to accommodate an electric vehicle. In order to charge your car’s battery while you are not driving it, you will need to install a home charging station in your garage. At the very least, an electric car requires a 120-volt circuit, but a typical car can take 20 to 25 hours to fully charge when using a standard household outlet. To cut down on charging time, it is best to use a 240-volt charger, which can charge a vehicle in half the time. These chargers require the installation of a dedicated 240-volt outlet, which can be done by an electrician. One important consideration when installing a charging station is the length of the cord. Be sure that the outlet installed by the electrician and the placement of the charging station leave enough room for the cord to reach the car. The large amount of current carried over your charging station’s electrical cables can be a cause for concern, so it is important to be sure that it is installed correctly and connected to your home’s circuit breaker. It is also a good idea to invest in high-quality home surge protection, ensuring that your house’s and car’s electrical systems are safe from events such as lightning strikes. Finally, you should be sure to keep a foam fire extinguisher on hand; even though the chances of a battery catching fire are very low, it is best to be prepared to protect yourself and your home from fire damage. 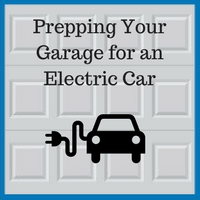 Electric cars provide many benefits, but to get the most out of these energy efficient vehicles, you should invest in updates to your garage that will allow you to store and charge your vehicle safely. If you have any questions on how to create the ideal garage for your electric car, contact the garage professionals at Blue Sky Builders. With more than 39 years of experience in the garage sector, we can work with you to make the updates and modifications you need. Contact us at 630-852-8485.